When this post gets published, we will have already boarded our airplane and getting ready for take off. We are headed to Crown Paradise in Puerto Vallarta and we are all very excited. We had planned on surprising the kids on the plane but Greg wanted the girls to know early because he said the anticipation of the trip was half the fun so we told them after Christmas that we were going. Penelope has asked every day since then why we couldn't leave the following day. If only we could have Penelope!! 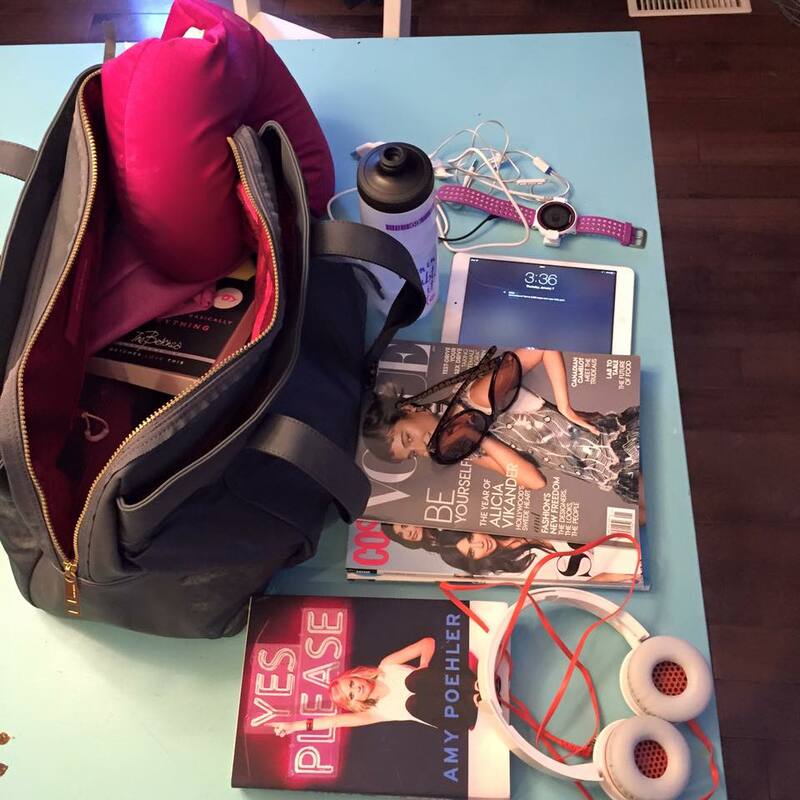 All of our bags are packed and we are ready to go. 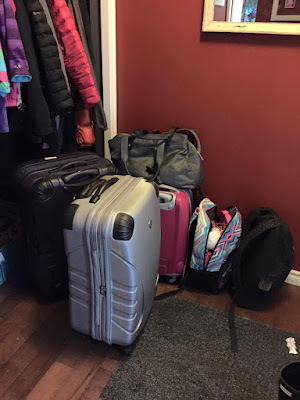 We originally were only going to take the 2 large suitcases but mine that I shared with the girls was borderline for being to heavy and Air Transat charges a lot if your suitcase weighs more then 44 lbs and it was hovering around 41 so to be safe we moved all of my stuff to the pink suitcase you see there and the girls had the purple one to themselves. Why does Greg get a large one to himself? Well his is full of scuba gear and life jackets and he packs lightly so his clothes fit in no problem. I packed up the girls carry on bags and finished mine too. Greg doesn't take carry on when we check luggage so he will just toss his iPad in my bag when he's not using it. I bought the girls a swimming barbie, markers, pencils, activity books + notebooks to keep them occupied both on the plane and during down time at the resort. Finley also has a bunch of spelling and math homework from her teacher. I bought Hotel Transylvania 2 for their tablets and I am typing this while they download. It's a really good movie if you haven't yet seen it. We don't ever get to sit together and we won't tomorrow and I always take Penelope because she is always asleep before the plane even takes off which is great. The first time we flew with her, I got stuck with her and I was afraid it was going to be the worst 6 hours of my life but she's a great flyer. She sleeps all the time and has on every flight since. Finley has never slept on a airplane and is a lot of work but we are hoping she is not too high maintenance these days!! My carry on is pretty basic - nothing too unusual. I have my iPad although I don't have any games on it. I don't play games so I don't have them. Everybody always thinks that it is weird but I just don't like them. I don't have games on my iPhone either. Am I alone in this?? I hope not!! I have 2 movies that I purchased through iTunes that I can watch if I need to. I have That Awkward Moment and Neighbours - both starring Zac Efron. Both are a few years old but I like watching them. I might buy Trainwreck tonight but haven't decided. I think AirTransat has the screens like Air Canada does and you can pick your show or movie to watch. WestJet does too. It's been a long time since I have been on a AirTransat flight so not sure what they do during flights. I also have 4 old Cosmo magazines that were piling up in my mail basket and I bought Vogue at the grocery store the other day. It has the feature with Justin + Sophie Trudeau in it. I have two books - Amy Poehler's Thank You and Nice is a Place in France which I bought more then a year ago and still have not read (this is why reading one book a month is a thing for #37by37). And of course, I have sunglasses, headphones, empty water bottle to fill once through security and my running watch and my various chargers - iPhone, iPad, watch + fitbit. I am also bringing my day planner and some pens but those are not shown here either. And everything fits into my Lululemon Om The Day bag which is great. I just bought this bag and I LOVE it. I have a love hate relationship with all Lululemon bags but I think I finally found one that I love. Well at least for now. I have a few blog posts to publish while I am gone but I didn't have time to get as many done as I like so try not to miss me too much while I am away! See you in 8 days!